Datin. You can buy that wig at Pasar Larkin, JB for RM50 sahaja…! KUALA LUMPUR: Arguably the most hated woman in Malaysia, Rosmah Mansor, PM Najib’s wife has caused yet another stir when she complained that hairdressers, tailors and make-up artists who make house calls, had begun to increase their prices. Highlighting this at a GST briefing in Petaling Jaya, Rosmah said she too was not spared from the predicament and had to fork out RM1,200 each time she had to dye her hair at home. “But what about housewives like us, with no income?” she said during the briefing, which was attended by other wives of ministers and deputy ministers (Bakti). 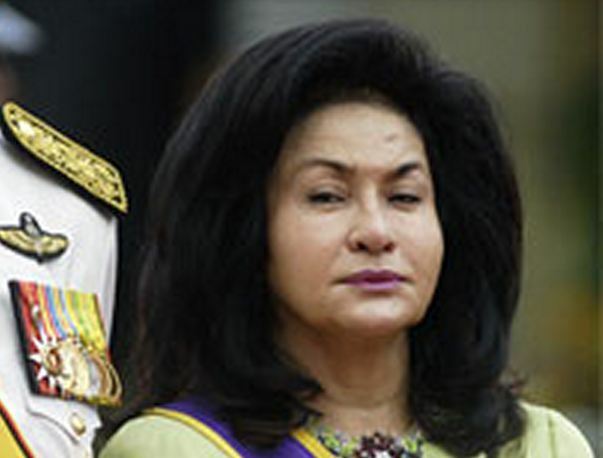 Rosmah Mansor is no stranger to controversy. The thrice-married commoner did not endear to the masses when she called herself the First Lady Of Malaysia (FLOM), a title reserved for the Malaysian Queen. She is also said to head a department within her husband’s Prime Minister Office with a yearly budget of RM100 mil. She is reviled for her overseas shopping sprees, at times using her husband’s government jet and was once embroiled in a controversy when she reportedly bought a RM24 mil diamond ring which she denied. There were also rumours that she had a hand in the murder of a Mongolian woman Atlantunya although no evidence was ever found to substantiate this. Meanwhile, it is open-season for the internet brigades with internet posters chiding her for her apparent lack of compassion for the millions of Malaysians struggling with high cost of living. “All Malaysians are horrified and shedding buckets full of tears for the sufferings of Rosmah! She ought to be getting all the things that she needs free from the rakyat.